The Easy Move is a London based moving company, providing affordable residential and commercial moving services throughout London, Ontario. Our movers are constantly under the spot light to prove that we truly are the best movers in London, Ontario. 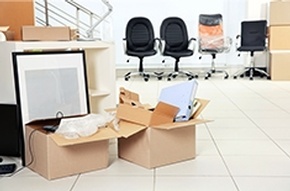 Moving your Office's in London Ontario? The Easy Move Movers offers the best business moving solutions in London. Do your employees enjoy packing cardboard boxes? Buying tape and hoping they know how to properly build a box? The Easy Move offers the best moving supply system anywhere in London Ontario.